Born in Wickham, Hampshire, Colin Block studied horn, piano, composition and conducting at the Royal Academy of Music in London. In 1965 he came to Dublin as a horn player in the RTE National Symphony Orchestra, and became very active as a conductor of various instrumental groups which frequently broadcast on RTE. 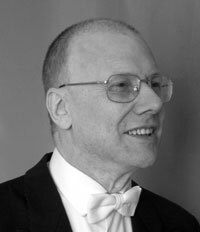 For many years he ran his own chamber orchestra called “Serenata”, led by Alan Smale, and he has also been guest conductor with the RTE Symphony Orchestra, the RTE Concert Orchestra, NICO, the RTE Singers, the National Chamber Choir, and the Orchestra of St. Cecilia. He later developed a keen interest in choral conducting and training and has appeared with numerous choirs over the years. He has as a result gained an enviable reputation as one of Ireland’s foremost choral directors. He has also been involved in musical comedy with the Clontarf, Bray, Greystones, Glencullen and Navan musical societies. In 1980 he resigned from the RTE Symphony Orchestra for health reasons, and despite a constant and debilitating battle with chronic back pain, is currently Co Musical Director and regular conductor of the Dublin County Choir. In 2007 he retired from the Culwick Choral Society, and was by far the longest serving Musical Director (21 years) in its long history. Colin is married to pianist Carole, formerly a bassoonist in the RTE Concert Orchestra: they have two sons, five grandsons and one great-grandson. For many years he, Carole, and their eldest son Robert ran a recording and photographic studio called The Dream Factory, which, amongst many other things, did commercial album recordings for choirs, demo CD’s for vocal soloists, and portrait photography. Colin spent many happy years in the 1990’s as a hang glider pilot, until an accident persuaded him that flying radio-controlled model aeroplanes was a much better idea! 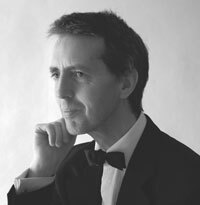 John is newly Co-Director with Colin for the Dublin County Choir, and is also currently conductor of the Goethe-Institut Choir, music teacher in St Patrick’s Cathedral Grammar School. After 24 years as Organist and Master of the Choristers in St Patrick’s Cathedral Dublin, he is now organist in Whitechurch Parish Church. Previously he had been an Organ Scholar in Jesus College, Oxford, and at St Paul’s Cathedral London, studying orchestral conducting with the late Norman Del Mar in the Royal College of Music. It’s been a busy Christmas at the National Concert Hall for John: On Sunday 2nd December he conducted the Dublin County Choir’s Christmas Family Gala, and On 10th December he was back with the Goethe-Institut Choir, the Young European Strings and the Choirboys of St Patrick’s Cathedral to conduct the spectacular and rarely-heard choral variations A Boy was Born by Benjamin Britten marking the start of the celebrations marking the centenary of the composer’s birth. On Good Friday 2014 he conducts the Goethe-Institut Choir and Dublin Orchestral Players in Rossini’s Stabat Mater in St Patrick’s in aid of the Carmichael Centre for Voluntary Groups. Celine Kelly studied piano with Frank Heneghan at the Dublin College of Music. Following numerous competition successes, and having graduated from Trinity College Dublin with an Honours degree, she spent two years at the Royal College of Music, obtaining a Performer’s Diploma. To date, Celine has accompanied many solo artists and choirs in performances in Moscow, France, Italy, USA, China and throughout Ireland. 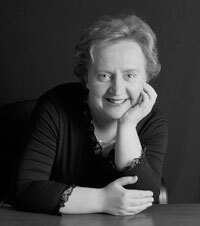 She is currently on the teaching staff of DIT Conservatory of Music and Drama. 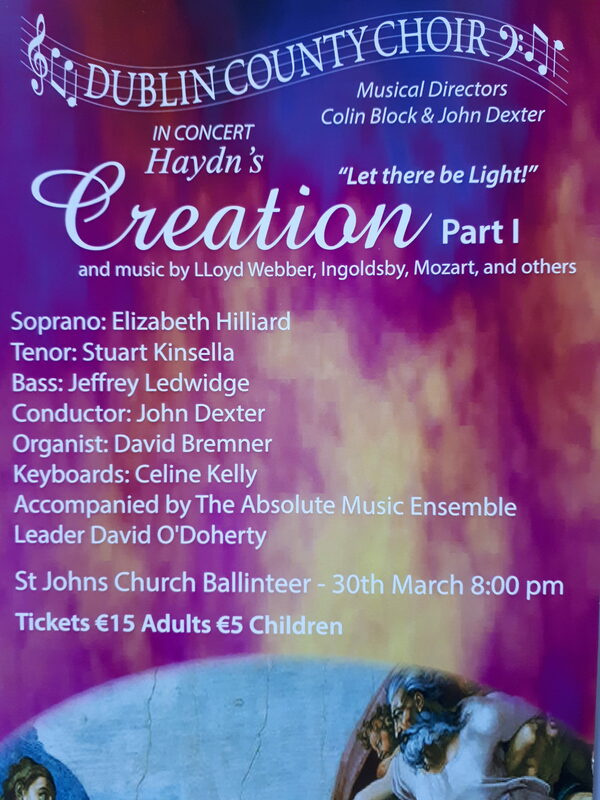 Dublin County Choir's next concert will be on 30th March 2019 in the church of St. John the Evangelist, Ballinteer.